Leading online classifieds site Quikr has raised $60 million (around Rs. 365 Cr) in their latest round of funding led by Tiger Global Management. With this round of funding Quikr’s valuation has now ballooned to around $300 million (Rs. 1800 Crore). Their existing investors Kinnevik, eBay, Omidyar Network, Matrix Partners India, Nokia Growth Partners and Norwest Venture Partners also participated in this round. This is Quikr’s second raise in 2014. Earlier in March they had raised USD 90 million funding led by Swedish investment firm Kinnevik with participation from their existing investors. During that round Quikr’s valuation was pegged at $250 million. With this round, Quikr has raised around over USD 2o0 million in till date. The latest round of funding will be utilized for product development and expansion of their mobile business. Quikr was launched in 2008 by IIT and IIM Alumnus Pranay Chulet and Jiby Thomas and is currently present in 940 cities across India. Quikr provides the local classifieds platform that helps users to buy, sell, rent and find products and services across various categories. These categories numbering over 12 and sub-categories over 140 range from Mobiles, real estate, cars, services, jobs, entertainment, furniture, electronics etc. Indian classified sector is currently booming and two players, Quikr and Naspers backed OLX, are both fighting tooth and nail to garner market share. Both the players have been aggressively advertising on TV and other media channels to get better of each other. As far as their traffic goes, both are currently having similar amounts of traffic. A comparison chart shows how closely both are currently placed. 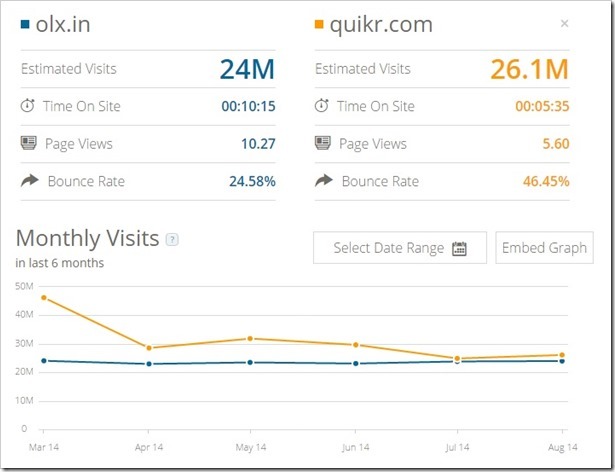 While Quikr has marginally more traffic, OLX drives more engagement on their site. Time will tell who will come out on top, but as of now both the players are evenly matched with each other.